Getting back into the grind on a Monday is tough after such a fun weekend! Sigh. But I’m also glad to be back to normal, healthy eating after a lot of decadent eating. 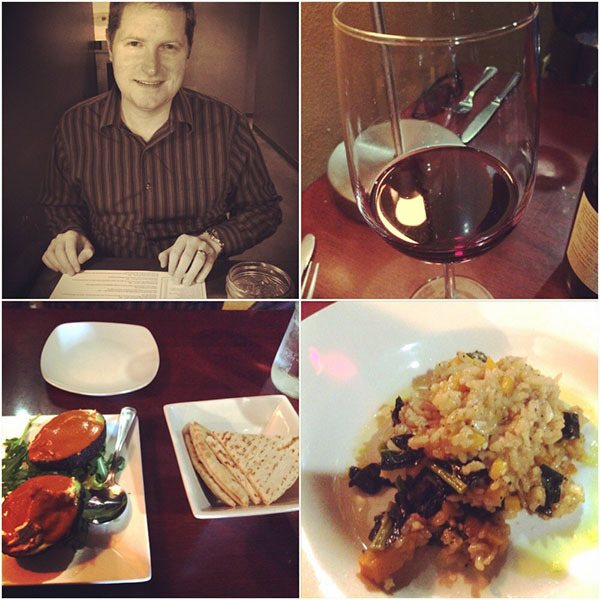 All this weekend we celebrated a big birthday for hubby starting with a movie and nice dinner out Friday. Saturday we headed to The Chef’s Table for a fancy birthday dinner and local bottle of wine. Usually they have minimal vegan options on their menu, but they’ve never had a problem creating something custom for me and did not disappoint this time! We started with avocados stuffed with hummus and a spicy pepper sauce served with pita bread for spreading the mixture. It was a crazy and unique flavor combo that was spicy, creamy, savory, and very rich. I’m thinking I need to recreate it soon! My main course was seasoned risotto with butternut squash and kale. The original dish also had Parmesan cheese that they left out for me and I don’t think it needed it because it was tangy with a savory kick. 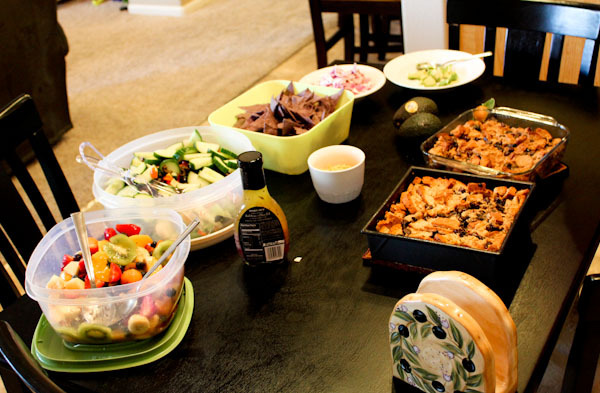 Sunday we headed over to my sister’s house for a family birthday party where, as usual, there was too much food! We tried to include all his favorite comfort foods. I selected the mac and “cheese” and bread pudding recipes from Peas and Thank You since those are two of his favorites. And my sister made a huge pot of vegan bean chili, plus we made salads, fruit salads, and oh my! 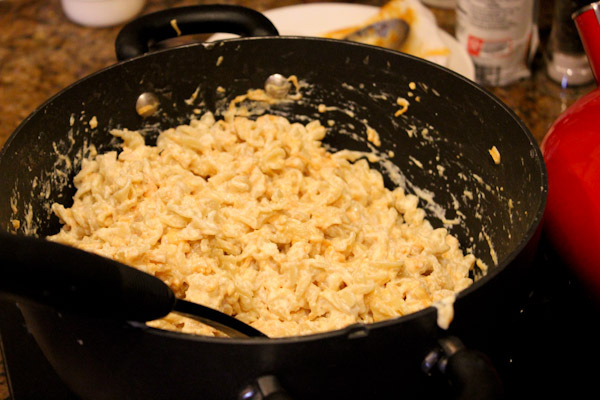 The mac and “cheese” recipe is very simple to make because it coats cooked pasta with a blended cream sauce made from tofu, almond milk, dry mustard and other seasonings. Then a bag of Daiya vegan cheese is mixed in for a cheesier flavor and texture, so it’s not cheap. But totally worth it for special occasions. 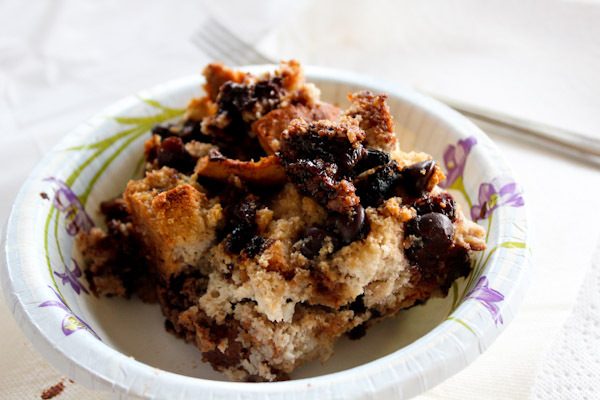 Between my sister and I, we made two versions of the bread pudding, one using gluten-free bread and the other using plain wheat bread to experiment and see which one came out better. The food spread was impressive and colorful! 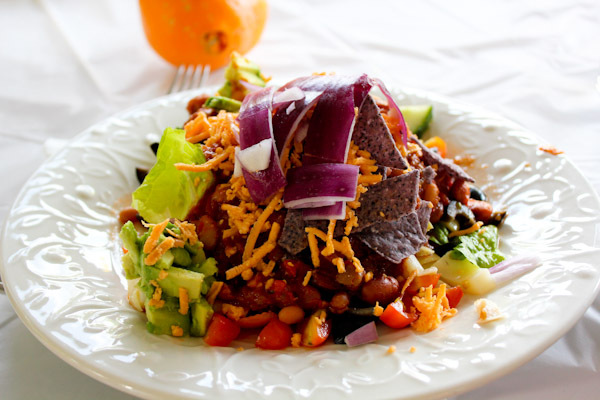 For my main course, I layered vegan chili over salad, then layered Daiya vegan cheese, blue corn chips, and onion for a gorgeous mess. 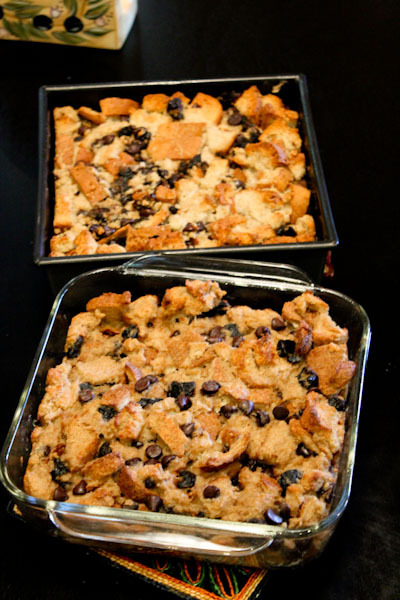 And tried a little of each bread pudding for dessert. The wheat bread version seemed a little more moist and creamier, but the gluten-free version had crispier edges and they were both good. And I’m truthfully still recovering after a long weekend of decadent eating, happy to be back to smoothies and salads today! LOVE all the color, of course! Eat the Rainbow! Woot! Thanks and colorful salads are so uplifting, aren’t they? It’s hard not to eat a lot when birthdays roll around ;) Looks like you guys had a fun time! True, especially when there’s a lot of great food around!